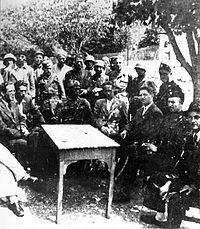 The Ustaša – Croatian Revolutionary Movement (Croatian language: Ustaša – Hrvatski revolucionarni pokret ) was a Croatian fascist and terrorist organization which was active before and during World War II. Its members, Ustaše (pronounced [ûstaʃe], also anglicised Ustashe, Ustashas or Ustashi) were responsible for the deaths of hundreds of thousands of citizens of Yugoslavia, particularly Serbs. The ideology of the movement was a blend of Fascism and ultraconservatism. Ustaše supported the creation of a Greater Croatia that would span to the River Drina and to the border of Belgrade. The movement emphasized the need for a racially "pure" Croatia and promoted persecution and genocide against Serbs, Jews and Romani people. Fiercely nationalistic, the Ustaše were also fanatically Catholic. In the Yugoslav political context, they identified Catholicism with Croatian nationalism. Following Croatian nationalism, they declared that the Catholic and Muslim faiths were the religions of the Croatian people. The Ustaše also saw the Islam of the Bosniaks as a religion which "keeps true the blood of Croats". The movement functioned as a terrorist organization before World War II, but in April 1941, they were appointed to rule a part of Axis-occupied Yugoslavia as the Independent State of Croatia (NDH), which has been described as both an Italian-German quasi-protectorate, and as a puppet state of Nazi Germany. The Ustaše were chiefly responsible for the World War II Holocaust in the NDH. Around three hundred thousand were killed by the NDH government's racial policies, which condemned many Serbs, Jews and Roma to death in the concentration camps, alongside Croat resistance members and political opponents. When it was founded in 1930, as Ustaša – Croatian Revolutionary Organization (Croatian language: Ustaša – Hrvatska revolucionarna organizacija ) it was a nationalist organization that sought to create an independent Croatian state. When the Ustaše came to power in the NDH, a quasi-protectorate established by Fascist Italy and Nazi Germany during World War II, its military wings became the Army of the Independent State of Croatia and the Ustaše militia (Croatian language: Ustaška vojnica ). The NDH collaborated with the Italian and German occupation forces in Yugoslavia in fighting an increasingly unsuccessful campaign against the resistance forces, the Yugoslav Partisans, who were recognized in late November 1943 as the military of the Allied Yugoslav state. As German forces withdrew from Yugoslavia in 1944/1945, the Ustaše mostly left the country, some of them remained in SFR Yugoslavia as a resistance group known as Crusaders and large numbers of them were killed without trial by Yugoslav forces (the Partisans) after the end of the war. The word ustaša (plural: ustaše) is derived from the intransitive verb ustati (Croatian for rise up). "Pučki-ustaša" (German language: Landsturm) was a military rank in the Imperial Croatian Home Guard (1868–1918). The same term was the name of Croatian third-class infantry regiments (German language: Landsturm regiments) during World War One 1914–1918. Another variation of the word ustati is ustanik (plural: ustanici) which means an insurgent, or a rebel. The name ustaša did not have fascist connotations during their early years in the Kingdom of Yugoslavia as the term "ustat" was itself used in Herzegovina to denote the insurgents from the Herzegovinian rebellion of 1875. The full original name of the organization appeared in April 1931 as the Ustaša – Hrvatska revolucionarna organizacija or UHRO (Ustaša – Croatian revolutionary organization), though in 1933 it was renamed the Ustaša – Hrvatski revolucionarni pokret (Ustaša – Croatian revolutionary movement) which it kept until World War II. One of the major ideological influences of the Croatian nationalism of the Ustaše was 19th century Croatian activist Ante Starčević. Starčević was an advocate of Croatian unity and independence and was both anti-Habsburg and anti-Serbian. He envisioned the creation of a Greater Croatia that would include territories inhabited by Bosniaks, Serbs, and Slovenes, considering Bosniaks and Serbs to be Croats who had been converted to Islam and Orthodox Christianity while considering the Slovenes to be "mountain Croats". He argued that the large Serb presence in territories claimed by a Greater Croatia was the result of recent settlement, encouraged settlement by Habsburg rulers, and the influx of groups like Vlachs who took up Orthodox Christianity and identified themselves as Serbs. Starčević declared his admiration for Bosniaks because in his view they were Croats who tactically had adopted Islam to preserve the economic and political autonomy of Bosnia and medieval Croatia under the rule of the Ottoman Empire. The Ustaše used Starčević's theories to promote the annexation of Bosnia and Herzegovina to Croatia and recognized Croatia as having two major ethnocultural components: Catholic Croats and Muslim Croats. The Ustaše deliberately sought to represent Starčević as being connected to their views, and falsely asserted that Starčević, as a liberal, never supported human equality or women's equality while portraying him as a racist. The Ustaše promoted the theories of Dr. Milan Šufflay who is believed to have claimed that Croatia had been "one of the strongest ramparts of Western civilization for many centuries" which he claimed had been lost with its union with Serbia in Yugoslavia in 1918. Šufflay himself had been murdered in Yugoslavia in 1931, allegedly by proponents of the regime, causing an internationally publicized affair. The Ustaše utilized the 1935 thesis by Reverend Krunoslav Draganović, which claimed that many Roman Catholics in southern Herzegovina had been converted to Orthodox Christianity in the 16th and 17th centuries, to justify a policy of forced conversion of Orthodox Christians in the area to Roman Catholicism. The Ustaše were heavily influenced by Italian Fascism and Nazism. Ante Pavelić's position of Poglavnik was based on the similar positions of Duce held by Benito Mussolini and Führer by Adolf Hitler. The Ustaše, like fascists, promoted a corporatist economy. Pavelić and the Ustaše were allowed sanctuary in Italy by Mussolini after being exiled from Yugoslavia. Pavelić had been in negotiations with Fascist Italy since 1927 that included advocating a territory-for-sovereignty swap in which he would tolerate Italy annexing its claimed territory in Dalmatia in exchange for Italy supporting the sovereignty of an independent Croatia. However Mussolini's support of the Ustaše was based on pragmatic maximization of Italian influence in the Balkans. After 1937 with the weakening of French influence in Europe following Germany's remilitarization of the Rhineland, and with the rise of a quasi-fascist government in Yugoslavia under Milan Stojadinović, Mussolini abandoned support for the Ustase from 1937 to 1939 and sought to improve relations with Yugoslavia, because he feared that continued hostility towards Yugoslavia would result in Yugoslavia joining the German sphere of influence. However the collapse of the quasi-fascist Stojadinović regime resulted in Italy restoring its support for the Ustaše and its agenda to promote an independent Croatia broken away from Yugoslavia that was in personal union with Italy. Distrust towards the Ustase grew, Mussolini's son-in-law and Italian foreign minister Count Galeazzo Ciano noted in his diary that "The Duce is indignant with Pavelić, because he claims that the Croats are descendants of the Goths. This will have the effect of bringing them into the German orbit". Nazi Germany initially held no support for an independent Croatia nor did it support the Ustaše and Hitler stressed the importance for a "strong and united Yugoslavia". Nazi officials including Hermann Göring wanted Yugoslavia to be stable and officially neutral during the war to insure that Germany could continue to securely gain Yugoslavia's raw material exports. The Nazis also grew aggravated with the Ustase, among them Reichsfuhrer SS Heinrich Himmler who was dissatisfied with the lack of full compliance by the NDH to the Nazis' agenda of extermination of the Jews, since the Ustaše permitted Jews who converted to Catholicism to be recognized as "honorary Croats" who were exempt from persecution. In 1933, the Ustaše presented "The Seventeen Principles" that formed the official ideology of the movement. The Principles stated the uniqueness of the Croatian nation, promoted collective rights over individual rights, and declared that people who were not Croat by "blood" would be excluded from political life. Those peoples considered "undesirables" were subjected to mass murder. The Principles called for the creation of a new economic system that would be neither capitalist nor communist. The Principles emphasized the importance of the Roman Catholic Church and the patriarchial family as means to maintain social order and morality. (The name given by modern historian to this particular aspect of Ustaše ideology varies; "national Catholicism", "political Catholicism" and "Catholic Croatism" have been proposed among others.) In power, the Ustaše banned contraception and tightened laws against blasphemy. Joseph Deniker's map of European races (1899) identified "Dinarics" as the dominant group in parts of central Europe, Northern Italy and the North West Balkans. The Ustase accepted that Croats were part of the Dinaric race, but rejected the concept that Croats were primarily a Slavic people and claimed that Croats were primarily the descendents of the stronger Germanic roots with the Goths than Slavic roots. The Ustaše believed that a government must naturally be strong and authoritarian. The movement opposed parliamentary democracy for being "corrupt" and Marxism and Bolshevism for interfering in family life and the economy and for their materialism. The movement considered political institutions such as political parties and parliaments to be harmful and unnatural. The Ustaše recognized both Roman Catholicism and Islam as the national religions of the Croatian people but initially rejected Orthodox Christianity as being incompatible with their objectives. Though the Ustase emphasized religious themes, it stressed that duty to the nation took precedence over religious custom. The Ustaše in power banned the use of the expression of "Serbian Orthodox faith" and mandated the use of the expression "Greek-Eastern faith" in its place. The Ustaše persecuted "Old Catholics" who did not recognize papal infallibility. Orthodox Christian churches were closed, destroyed, or plundered during Ustaše rule. The Ustaše altered their stance towards the Orthodox faith in August 1941 when the NDH allowed those Orthodox Serbs who held no political association with Serbia to be permitted to attain Croatian citizenship and be declared an Aryan person. On 2 July 1942 the Croatian Orthodox Church was founded, and Orthodoxy thus became one of Croatia's state religions. The Ustaše attached conditions to citizenship of people of Islamic faith, such as asserting that a Muslim who supported Yugoslavia would not be considered a Croat, nor a citizen but a "Muslim Serb" who could be denied property and imprisoned. The Ustase claimed that such "Muslim Serbs" had to earn Croat status. The Ustaše persecuted Jews who practiced Judaism but it authorized Jewish converts to Catholicism to be recognized as Croatian citizens and be given honorary Aryan citizenship that allowed them to be reinstated in their jobs that they had lost due to their previous practice of Judaism. In economics, the Ustaše supported the creation of a corporatist economy. The movement believed that natural rights existed to private property and ownership over small-scale means of production free from state control. Armed struggle, revenge, and terrorism were glorified by the Ustaše. Map of a Greater Croatia in a 1939 article of the Ustaše Hrvatski Domobran newspaper associated with the Ustase organization of the same name, Hrvatski Domobran, that sought recruitment of Croat emigres in Argentina and other countries. This article rejects the Cvetković–Maček Agreement and the borders that it provided to Croatia as insufficient. In October 1928, after the assassination of leading Croatian politician Stjepan Radić, Croatian Peasant Party President in the Yugoslav Assembly by radical Montenegrin politician Puniša Račić, a youth group named the Croat Youth Movement was founded by Branimir Jelić at the University of Zagreb. A year later, Ante Pavelić was invited by the 21-year-old Jelić into the organization as a junior member. A related movement, the Domobranski Pokret, which had been the name of the legal Croatian army in Austria-Hungary, began publication of Hrvatski Domobran, a newspaper dedicated to Croatian national matters. The Ustase sent Hrvatski Domobran to the United States to garner support for the Ustase from Croatian Americans. The organization around the Domobran tried to engage with and radicalize moderate Croats, using Radić’s murder to stir up emotions in the country. By 1929, however, two divergent political streams had formed within Croatia: some supported the Pavelić view that only violence could secure Croatia's national interests; however, the Croatian Peasant Party, led then by Vladko Maček, successor to Stjepan Radić, had much greater support among Croats. Various members of the Croatian Party of Rights contributed to the writing of the Domobran, until around Christmas 1928 when the newspaper was banned by the authorities of the Kingdom of Serbs, Croats and Slovenes. In January 1929, the King banned all national parties, and the radical wing of the Party of Rights was exiled, among them Ante Pavelić, Gustav Perčec and Branimir Jelić. This group was later joined by several other Croatian exiles. On 20 April 1929, Pavelić and others co-signed a declaration in Sofia, Bulgaria together with members of the Macedonian National Committee, asserting that they would pursue "their legal activities for the establishment of human and national rights, political freedom and complete independence for both Croatia and Macedonia". Due to this, the Court for the Preservation of the State in Belgrade sentenced Pavelić and Perčec to death on 17 July 1929. The exiles started organizing support for their cause among the Croatian diaspora in Europe, North and South America. In January 1932, they named their revolutionary organization "Ustaša". In November 1932, ten Ustaše led by Andrija Artuković, supported by four local sympathisers, attacked a gendarme outpost at Brušani in the Lika/Velebit area. The goal of attack was to scare Yugoslav authorities. The incident has sometimes been termed the Velebit Uprising. Universal Newsreel's film about the assassination. One of the most important actions of Ustaše was assassination of Yugoslav king Alexander I. Organizer of assassination was Eugen Dido Kvaternik while the assassin was Vlado Chernozemski, member of the Internal Macedonian Revolutionary Organization (IMRO). Soon after the assassination, all organizations related to the Ustaše as well as the Hrvatski Domobran, which continued as a civil organization, were banned throughout Europe. Pavelić and Kvaternik were detained in Italy from October 1934 until the end of March 1936. After March 1937, when Italy and Yugoslavia signed a pact of friendship, Ustaše and their activities were banned. However, not only did these events fail to destroy the Ustaša organization, but it even attracted sympathizers among the Croatian youth, especially among university students. In February 1939, two of these returnees, Mile Budak and Ivan Oršanić, became editors of the newly published magazine Hrvatski narod ("The Croatian nation"), which supported the Ustaše ideas of Croatian independence. Meanwhile Pavelić and several hundred Ustaše left their camps in Italy for Zagreb, where Pavelić declared new government on 16 April 1941. He accorded himself the title of "Poglavnik" — a Croatian approximation to "Führer" and translating to something like "Headman" in English. Independent State of Croatia was declared on Croatian "ethnic and historical territory" what is today Republic of Croatia (without Istria), Bosnia and Herzegovina, Syrmia and Bay of Kotor. However, a few days after the declaration of independence, the Ustaše were forced to sign the Treaty of Rome where they surrendered part of Dalmatia and Krk, Rab, Korčula, Biograd, Šibenik, Split, Čiovo, Šolta, Mljet and part of Konavle and Bay of Kotor in favor of Italy. De facto control over this territory varied for the majority of the war, as the Partisans grew more successful, while the Germans and Italians increasingly exercised direct control over areas of interest. The Germans and the Italians split the NDH into two zones of influence, one in the southwest controlled by the Italians and the other in the northeast controlled by the Germans. As a result, the NDH has been described as 'an Italian-German Quasi-Protectorate'. In September 1943, after Italian capitulation, the NDH annexed the whole territory which was annexed by Italy according to Treaty of Rome. The Army of the Independent State of Croatia was composed of enlisted men who did not participate in Ustaše activities. The fanatical Ustaše Militia, however, organised in 1941 into five (later 15) 700-man battalions, two railway security battalions, and the elite Black Legion and Poglavnik Bodyguard Battalion (later Brigade), fought with a merciless tenacity which impressed and appalled friend and foe alike. Historian Jonathan Steiberg describes Ustaša crimes against Serbian and Jewish civilians "Serbian and Jewish man woman and children were literary hacked to death". Reflecting on the pictures regarding Ustaša crimes taken by Italians, Steinberg writes "There are photographs of Serbian woman with breasts hacked off by kitchen knives, man with eyes gouged out, emasculated and mutilated"
By the end of 1942, the news about events at Jasenovac and elsewhere had also spread among the Croatian population. Writers Vladimir Nazor and Ivan Goran Kovačić escaped from Ustaše-held territory to join the Partisans, and were followed by others. In September 1942 an Ustaše Defensive Brigade was formed, and during 1943 the Ustaše battalions were re organised into eight four-battalion brigades (1st to 8th). In 1943, the Germans suffered major losses on the Eastern Front and the Italians signed an armistice with the Allies, leaving behind significant armaments that the Partisans used against the occupiers and the Ustaše. By 1944 Pavelić was almost totally reliant on Ustaše units, now 100,000 strong, formed in Brigades 1 to 20, Recruit Training Brigades 21 to 24, three divisions, two railway brigades, one defensive brigade and the new Mobile Brigade. In November 1944 the Army was effectively put under Ustaše control when the Armed Forces of the Independent State of Croatia were combined with the units of the Ustaše to form eighteen divisions, comprising 13 infantry, two mountain and two assault divisions and one replacement division, each with its own organic artillery and other support units. There were also several armoured units. Fighting continued for a short while after the formal surrender of German Army Group E on 9 May 1945, as Axis forces and many refugees attempted to escape to Austria. The Battle of Poljana, between a mixed German and Ustaše column and a Partisan force, was the last battle of World War II on European soil. Many of those fleeing were handed over to the Yugoslavs on the Austrian border, to be subsequently either executed or sent on a "death march" back into the country, an episode known as the Bleiburg tragedy. Pavelić, however, with the help of associates among the Franciscans, managed to escape and hide in Austria and Rome, later fleeing to Argentina. After World War II, the remaining Ustaše went underground or fled to countries such as Canada, Australia, Germany and South America, with the assistance of Roman Catholic churches and their grassroots supporters Some of them persisted in their crusade against Yugoslavia. With the defeat of the Independent State of Croatia, the movement ceased to exist. Infighting over the failure to establish a Croatian state also fragmented the surviving Ustaše. Ante Pavelić formed the Croatian Liberation Movement which drew several of the former state's leaders. Vjekoslav Vrančić founded a reformed Croatian Liberation Movement, and was its leader. Vjekoslav Luburić formed the Croatian National Resistance. Blagoje Jovović, a Montenegrin Serb Chetnik, shot Ante Pavelić near Buenos Aires on 9 April 1957, inflicting injuries from which he later died. One third of the Serbs were to be killed. One third of the Serbs were to be expelled (ethnically cleansed). One third of the Serbs were to be forcibly converted to Catholicism. The NDH government cooperated with the Nazi Germany in the Holocaust and exercised their own version of the genocide against ethnic Serbs living in their borders. State policy about Serbs has been first declared in words of Milovan Žanić minister of NDH Legislative council on 2 May 1941: "This country can only be Croatian country, and there is no method we would hesitate to use in order to make it truly Croatian and cleanse it of Serbs, who have for centuries endangered us and who will endanger us again if they are given opportunity". The Ustaše enacted race laws patterned after those of the Third Reich, which were aimed against Jews and Roma and Serbs, who were collectively declared enemies of the Croatian people. Serbs, Jews, Roma and Croatian anti-fascists, including Communist Croats, were interned in concentration camps, the largest of which was the Jasenovac complex, where many were killed by Ustaše militia. The exact number of victims is not known. By the end of war, the Ustaše, under Pavelic's leadership, exterminated 30,000 Jews, about 29,000 Gypsies, and between 300,000 and 600,000 Serbs. Due to differing views and lack of documentation, estimates for the number of Serbian victims in Croatia range widely, from 25,000 to more than one million. The estimated number of Serbs killed in Jasenovac ranges from 25,000 to 700,000. The most reliable figures place the number of Serbs killed by the Ustaša between 330,000 and 390,000, with 45,000 to 52,000 Serbs murdered in Jasenovac. The Jasenovac Memorial Area, currently headed by Slavko Goldstein, keeps a list of 59,188 names of Jasenovac victims that was gathered by government officials in Belgrade in 1964. Because the gathering process was imperfect, they estimated that the list contains between 60 and 75 percent of the total victims, putting the number of killed in that complex at about 80,000–100,000. The previous head of the Memorial Area Simo Brdar estimated at least 365,000 dead at Jasenovac. The analyses of the statisticians Vladimir Žerjavić and Bogoljub Kočović were similar to those of the Memorial Area. In all of Yugoslavia, the estimated number of Serb deaths was 487,000 according to Kočović, and 530,000 according to Žerjavić, out of a total of 1,014,000 or 1,027,000 deaths (resp.). Žerjavić further stated that there were 197,000 Serb civilians killed in NDH (78,000 as prisoners in Jasenovac and elsewhere) as well as 125,000 Serb combatants. The Belgrade Museum of Holocaust compiled a list of over 77,000 names of Jasenovac victims. It was previously headed by Milan Bulajić, who supported the claim of a total of 700,000 victims. The current administration of the Museum has further expanded the list to include a bit over 80,000 names. During the 1961 trial of Adolf Eichmann, Alexander Arnon (secretary of the Jewish Community in Zagreb) testified about the treatment of Jews in Yugoslavia during the war. During World War II, various German military commanders and civilian authorities gave different figures for the number of Serbs, Jews and others killed on the territory of the Independent State of Croatia. Tomasevich has observed that some of these figures may have been a 'deliberate exaggeration' fostered to create further hostility between Serbs and Croats so that they would not unite in resisting the Axis. These figures included 400,000 Serbs (Alexander Löhr); 500,000 Serbs (Lothar Rendulic); 250,000 to March 1943 (Edmund Glaise von Horstenau); more than "3/4 of a million Serbs" (Hermann Neubacher) in 1943; 600,000–700,000 in concentration camps until March 1944 (Ernst Fick); 700,000 (Massenbach). Out of around 39,000 Jews that lived on the territory that became the Independent State of Croatia, only around 20% survived the war. The Ustaše policies against Eastern Orthodoxy are incorrectly associated with "Uniatism" in some Eastern Orthodox circles. This term has not been used by the Roman Catholic Church except for Vatican condemnation of the idea in 1990. The Ustaše represented an extreme example of "Uniatism" rather based on nationalism than on religion. They supported violent aggression or force in order to convert Serbo-Croatian speaking Serbian Orthodox believers. The Ustaše held the position that Eastern Orthodoxy, as a symbol of Serbian nationalism, was their greatest foe. The Ustaše never recognized the existence of a Serb people on the territories of Croatia or Bosnia – they recognized only "Croats of the Eastern faith". They also called Bosniaks "Croats of the Islamic faith", but they had a stronger ethnic dislike of Serbs. Some former priests, mostly Franciscans, particularly in, but not limited to, Herzegovina and Bosnia, took part in the atrocities themselves. Miroslav Filipović was a Franciscan friar (from the Petrićevac monastery) who allegedly joined the Ustaša army on 7 February 1942 in a brutal massacre of 2730 Serbs of the nearby villages, including 500 children. He was allegedly subsequently dismissed from his order and defrocked, though when he was hanged for his war crimes, he wore his Franciscan robes. Filipović became Chief Guard of Jasenovac concentration camp where he was nicknamed "Fra Sotona", and he was given this nickname by Croats themselves. For the duration of the war, the Vatican kept up full diplomatic relations with the Ustaša state (granting Pavelić an audience), with its papal nuncio in the capital Zagreb. The nuncio was briefed on the efforts of religious conversions to Roman Catholicism. After World War II was over, the Ustaše who had managed to escape from Yugoslav territory (including Pavelić) were smuggled to South America. It is widely alleged that this was done through rat lines which were operated by members of the organization who were Catholic priests and who had previously secured positions at the Vatican. Members of the Illyrian College of San Girolamo in Rome were reputedly involved in this: friars Krunoslav Draganović, Petranović, and Dominik Mandić. The Ustaše regime had sent large amounts of gold that it had plundered from Serbian and Jewish property owners during World War II into Swiss bank accounts.Of a total of 350 million Swiss Francs, about 150 million was seized by British troops; however, the remaining 200 million (ca. 47 million dollars) reached the Vatican. In October 1946 the American intelligence agency SSU alleged that these funds were still held in the Vatican Bank. This issue is the theme of a recent class action suit against the Vatican Bank and others. See Alperin v. Vatican Bank. Cardinal Alojzije Stepinac, Archbishop of Zagreb during World War II, was accused of supporting the Ustaše, and of exonerating those in the clergy who collaborated with the Ustaše and were hence complicit in forced conversions. All in all, Croats and Serbs are of two worlds, northpole and southpole, never will they be able to get together unless by a miracle of God. The schism (between the Catholic Church and Eastern Orthodoxy) is the greatest curse in Europe, almost greater than Protestantism. Here there is no moral, no principles, no truth, no justice, no honesty. In 1998, Stepinac was beatified by Pope John Paul II. On 22 June 2003, John Paul II visited Banja Luka. During the visit, he held a mass at the aforementioned Petrićevac monastery. This caused public uproar due to the connection of the Petrićevac monastery with the crimes of former friar Filipović. At the same location, the pope also proclaimed the beatification of the Catholic layman Ivan Merz (1896–1928) who was the founder of the "Association of Croatian Eagles" in 1923, which many Serb nationalists and communists view as the precursor to the Ustaše. Roman Catholic apologists defend the Pope's actions by claiming that the convent at Petricevac was one of the places that went up in flames causing the death of 80-year-old Friar Alojzije Atlija. Further, that the war had produced "a total exodus of the Catholic population from this region"; that the few who remained were "predominantly elderly"; and that the church in Bosnia then risked "total extinction" due to the war. Therefore, supporters state that the focus on the anti-Croatian tragedy presently occurring is more important than focusing on one of 60 years ago. At the top of the command was the Poglavnik (meaning "head") Ante Pavelić. Pavelić was appointed the office as Head of State of Croatia after Adolf Hitler had accepted Benito Mussolini's proposal of Pavelic, on 10 April 1941. The Croatian Home Guard was the armed forces of Croatia, it subsequently merged into the Croatian Armed Forces. The symbol of the Ustaše was a capital blue letter "U" with an exploding grenade emblem within it. The flag of the Independent State of Croatia was a red-white-blue horizontal tricolor with the shield of the Coat of Arms or Croatia in the middle and the U in the upper left. Its currency was the NDH kuna. The checkered coat of arms of the NDH started with a white field in the corner, and that of today's Croatia starts with a red field in the corner. Some possible explanations are that the white field symbolizes the Croatian nationality, as opposed to the red field which symbolizes the Croatian state; or that the white field is used on the so-called war flag. This was used instead of the Nazi greeting Heil Hitler by the Ustaše. While the greeting was invented in the 19th century by Croatian ban Josip Jelačić, today it is nominally associated with Ustasha sympathisers by Serbs or non-Ustasha conservatives associated with the Croatian Party of Rights. However, some Croats see it as a patriotic salute, because it was used long before the Ustase regime and it emphasized the fact of defending your country, your home. In Internet communication, it is sometimes abbreviated as ZDS. ↑ Goldstein 2001, p. 133. ↑ "Ustasa (Croatian political movement) – Britannica Online Encyclopedia". Britannica.com. http://www.britannica.com/EBchecked/topic/620426/Ustasa. Retrieved 3 September 2012. ↑ Viktor Meier. Yugoslavia: a history of its demise. English edition. London, England, UK: Routledge, 1999 pp. 125. ↑ 9.0 9.1 9.2 9.3 9.4 Fischer 2007, pp. 207. "Fiercely nationalistic, the Ustaše were also fanatically Catholic. In the Yugoslav political context, they identified Catholicism with Croatian nationalism..."
↑ "Independent State of Croatia – Britannica Online Encyclopedia". Britannica.com. http://www.britannica.com/eb/topic-1413183/Independent-State-of-Croatia. Retrieved 3 September 2012. ↑ Watch, Helsinki (1993). War Crimes in Bosnia-Hercegovina. Human Rights Watch. ISBN 978-1-56432-083-4. http://books.google.com/?id=nltdtAo38K0C&pg=PA14. Retrieved 23 April 2008. ↑ Raič, David (2002). Statehood and the law of self-determination. Martinus Nijhoff Publishers. ISBN 978-90-411-1890-5. http://books.google.com/?id=L7UOyPGYBkwC&pg=PA81. Retrieved 23 April 2008. ↑ Der kroatische Ustascha-Staat, Die Ustascha an der Macht chapter, pp. 75–80. ↑ Fischer 2007, pp. 207–208. ↑ 24.0 24.1 24.2 Fischer 2007, p. 208. ↑ 26.0 26.1 Ramet 2006, p. 118. ↑ 31.0 31.1 31.2 31.3 Fischer 2007, p. 210. ↑ 32.0 32.1 32.2 32.3 32.4 32.5 Djilas, p. 114. ↑ 33.0 33.1 Martin L. Van Creveld. Hitler's Strategy 1940–1941: The Balkan Clue. 2nd edition. London, England, UK; New York, New York, USA: Cambridge University Press, 1974. pp. 6. ↑ Galeazzo Ciano, Malcolm Muggeridge (translator). Ciano's diary, 1939–1943. W. Heinemann, 1950. pp. 392. ↑ 35.0 35.1 Martin L. Van Creveld. Hitler's Strategy 1940–1941: The Balkan Clue. 2nd edition. London, England, UK; New York, New York, USA: Cambridge University Press, 1974. pp. 7–8. ↑ Fischer 2007, pp. 226. ↑ 37.0 37.1 37.2 37.3 Ramet 2006, p. 119. ↑ Fischer 2007, p. 209. ↑ Stanley G. Payne (1996). A History of Fascism, 1914–1945. University of Wisconsin Pres. p. 406. ISBN 978-0-299-14873-7. http://books.google.com/books?id=x_MeR06xqXAC&pg=PA406. ↑ 40.0 40.1 John R. Lampe (2004). Ideologies and National Identities: The Case of Twentieth-Century Southeastern Europe. Central European University Press. p. 102. ISBN 978-963-9241-82-4. http://books.google.com/books?id=gE1c4wK-ASAC&pg=PA102. ↑ 41.0 41.1 Nicholas Atkin, Frank Tallet. Priests, prelates and people: a history of European Catholicism since 1750. New York, New York, USA: I. B. Taurus & Co. Ltd., 2003. pp. 248. ↑ Caccamo Trinchese. Rotte adriatiche. Tra Italia, Balcani e Mediterraneo. FrancoAngeli, 2011. pp. 158. ↑ 45.0 45.1 45.2 45.3 45.4 Emily Greble. Sarajevo, 1941–1945: Muslims, Christians, and Jews in Hitler's Europe. Ithaca, New York, USA: Cornell University Press, 2011. pp. 125. ↑ Roger Griffin. The nature of fascism. Digital Printing edition. New York, New York, USA: Routledge, 2003 pp. 120. ↑ Peter Kivisto. The Ethnic enigma: the salience of ethnicity for European-origin groups. Cranbury, New Jersey, USA; London, England, UK; Mississauga, Ontario, Canada: Associated University Press, 1989. pp. 107. ↑ 52.0 52.1 Fischer 2007, p. [page needed]. ↑ Thomas 1995, p. 12. ↑ 56.0 56.1 "PHOTOGRAPHY". Jewish Historical Museum of Yugoslavia. 1941. http://www.ushmm.org/wlc/media_ph.php?lang=en&ModuleId=10005456&MediaId=2156. Retrieved 3 December 2007. ↑ Trifković, Srđa (21 April 2000). "The Real Genocide in Yugoslavia: Independent Croatia of 1941 Revisited.". ↑ 61.0 61.1 Thomas 1995, p. 17. ↑ 62.0 62.1 "US Army File: Dr. DRAGANOVIC' Krunoslav". jasenovac-info. Decemberlassified 12 September 1983. Archived from the original on 8 October 2007. http://web.archive.org/web/20071008210215/http://www.jasenovac-info.com/cd/biblioteka/pavelicpapers/army/ar0004.html. Retrieved 4 October 2007. ↑ "CIC Memorandum". jasenovac-info. Decemberlassified 12 September 1983. Archived from the original on 8 October 2007. http://web.archive.org/web/20071008210552/http://www.jasenovac-info.com/cd/biblioteka/pavelicpapers/pavelic/ap0010.html. Retrieved 4 October 2007. ↑ "Two Bullets for Pavelic" (PDF). 2003. Archived from the original on 23 April 2009. http://web.archive.org/web/20090423210448/http://pavelic-papers.com/features/tbfp.pdf. ↑ "Deciphering the Balkan Enigma: Using History to Inform Policy" (PDF). http://www.strategicstudiesinstitute.army.mil/pdffiles/PUB159.pdf. Retrieved 3 June 2011. ↑ "Jasenovac". Us-israel.org. http://www.us-israel.org/jsource/Holocaust/Jasenovac.html. Retrieved 3 September 2012. ↑ Alexander Arnon (19 May 1961). "The Trial of Adolf Eichmann – Session 46 – 4 Sivan 5721". vex.net. http://www.vex.net/~nizkor/hweb/people/e/eichmann-adolf/transcripts/Sessions/Session-046-05.html. Retrieved 4 October 2007. ↑ 72.0 72.1 72.2 Tomasevich 2001, p. 722. While German troops were still in several places in Croatia, the Croatians began a beasty persecution of the Orthodox [Serbs]. At this time at least a half million people were killed. An unbelievable governing mentality was responsible, as I learned in August 1943 when I received the answer to a question of mine from a government functionary in the circle of the chief of state. ↑ Lituchy 2006, p. 8. ↑ "UNIATISM, METHOD OF UNION OF THE PAST, AND THE PRESENT SEARCH FOR FULL COMMUNION". Vatican. 17–24 June 1993. http://www.vatican.va/roman_curia/pontifical_councils/chrstuni/ch_orthodox_docs/rc_pc_chrstuni_doc_19930624_lebanon_en.html. Retrieved 4 October 2007. "With regard to the method which has been called "uniatism", it was stated at Freising (June 1990) that "we reject it as method for the search for unity because it is opposed to the common tradition of our Churches"." ↑ Gorin, Julia (23 February 2010). "Mass grave of history: Vatican's WWII identity crisis". The Jerusalem Post. http://www.jpost.com/Features/InThespotlight/Article.aspx?id=169378. Retrieved 3 September 2012. ↑ Littlejohn, David (1994). Foreign Legions of the Third Reich. 3. R. James Bender Publishing. pp. 216–217. ISBN 978-0-912138-29-9. Aarons, Mark and Loftus, John: Unholy Trinity: How the Vatican's Nazi Networks Betrayed Western Intelligence to the Soviets. New York: St. Martin's Press, 1992. 372 pages. ISBN 978-0-312-07111-0. Fischer, Bernd J., ed (2007). Balkan Strongmen: Dictators and Authoritarian Rulers of South-Eastern Europe. Purdue University Press. ISBN 978-1-55753-455-2. Goldstein, Ivo (2001). Croatia: A History. Hurst & Co. ISBN 978-0-7735-2017-2. Thomas, N., K. Mikulan, and C. Pavelic. Axis Forces in Yugoslavia 1941–45. London: Osprey, 1995. ISBN 978-1-85532-473-2. Lituchy, Barry M. (2006). Jasenovac and the Holocaust in Yugoslavia. New York: Jasenovac Research Institute. ISBN 978-0-9753432-0-3. "Independent State of Croatia laws on Croatian – Zakonske osnove progona politickih protivnika i rasno nepodobnih u NDH" (PDF). http://www.crohis.com/izvori/ustzk.pdf. Retrieved 3 June 2011. Phayer, Michael (2000). The Catholic Church and the Holocaust, 1930-1965. Bloomington: Indiana University Press. http://books.google.com/books?id=fqUSGevFe5MC&printsec=frontcover. Jasenovac Research Institute — "a non-profit human rights organization and research institute committed to establishing the truth about the Holocaust in Yugoslavia."